Bo’s photo above clicks through his family’s account before his passing and the many ways they cared for their ailing friend. Most tick treatment articles recommend that dogs with medium to heavy coats must be trimmed. Maxx has really short hair and still we shaved it off to make sure the optimal amount of skin medication and tick preventive topicals get to his skin. This is a very practical tip since the medication can be very pricey. It is essential to know that the shave stage isn’t a glorious one. Your clipper (the shaving tool) and hands will get very bloody if you don’t pick out the ticks clinging to his skin. Ergo, groom your dog by painstakingly taking out the ticks (try hard to take out all of the parasites) prior to the big cut. ME: Off with his hair! While it was tough doing his hair, I’m lucky I had Wahl’s Pet Pro Deluxe Grooming Kit to make the job easier. It wasn’t a clean and handsome cut though; Maxx looked both horrible and hilarious after the dreadful canine ordeal. The first soap we used (we consumed two bars in total, I think) was Lori Amitraz. I cant recall why we stopped using it (our supplier ran out of it? Idk. Can’t remember. ), but it was a pretty good soap. 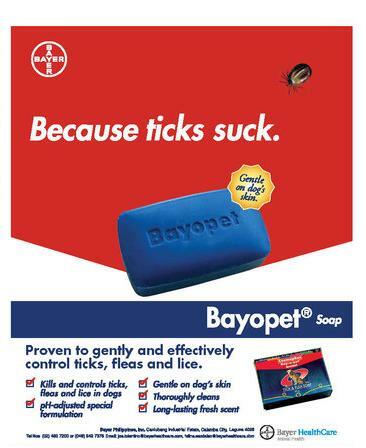 We opted to use Bayopet afterwards as it is one of the popularly efficient anti-flea soaps in the market. It is also important to make sure the dog is cleaned very well during bathing (done after the big shave) to remove dirt and whatever else is on his skin that’ll block a more potent liquid treatment that will be applied hereafter. We love the pun and we couldn’t agree more. 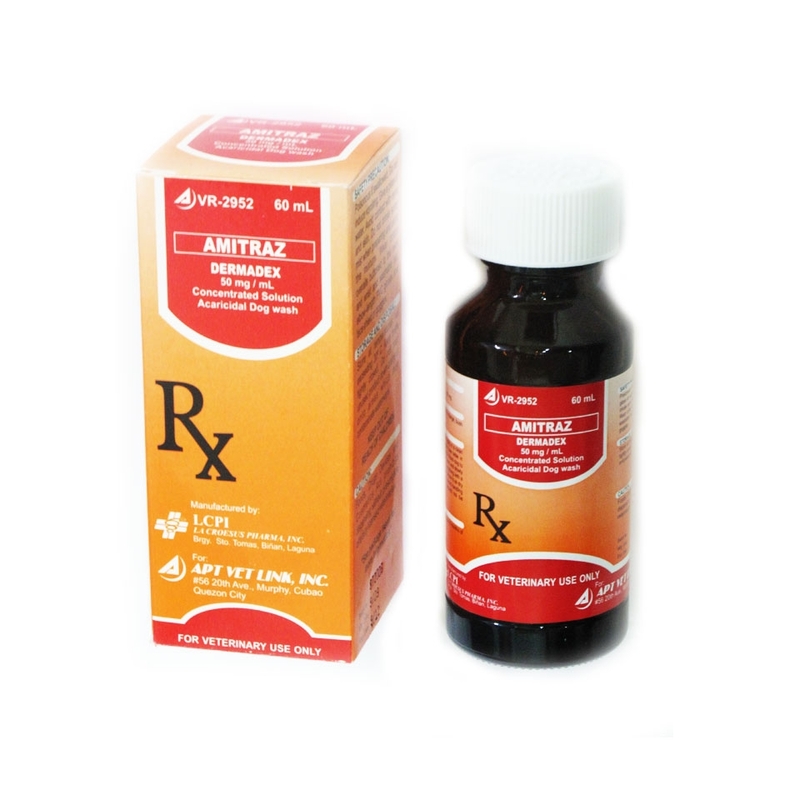 Dermadex, generic name: Amitraz, is indispensable in addressing the multitude of ticks and fleas. It is a highly potent solution that can cure skin problems but can equally kill your dog if misused. Be sure to read the package insert that comes with it. Since R is a vet, he was able to make sure Dermadex was on our side. 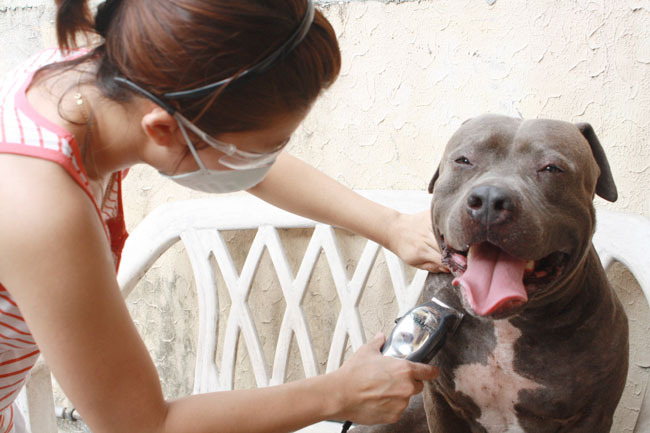 The dosage for treating sarcoptic mange and fleas is 5cc of the solution to 1 liter of water. We make another 5cc dermadex : 1 liter of water mixture and use it to clean the house, on those areas he often stays. Since Maxx is a house dog, we clean the entire first floor of our home and also the garage. For bigger spaces to clean, you may do 10cc : 2 liters. That about covers everything we did to keep Maxx tick-and-flea-free. It takes a whole lot of dedication to ensure our dogs are not being fed on by parasites and it’s the least we can do in exchange for their excited tail waggings, adorable sloppy licks, playful nibblings and unending love and loyalty. 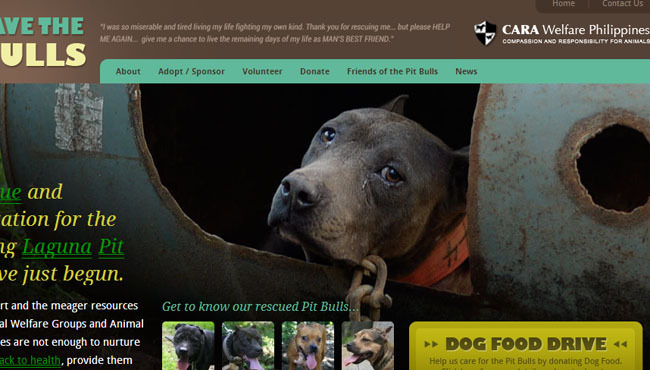 Few minutes ago, I checked back on Save the Laguna Pitbulls’ CARA web page to get myself updated on which of the pits got recently adopted. Lo and behold, the website’s home page has been revamped and the main photo blew me away— twas a picture of an adorable pittie who looked just like my Maxx. His eyes spoke to my soul despite being a plain, inanimate photograph. Now I’m just staring at the home page, admiring this cute pit. In a sec, I know I’ll be calling on Maxx to get beside me as I always want to cuddle him whenever I get aaaawww moments looking/watching other animals, dogs especially. Sickest fox .gif I know to-date. Pitbullera hopes to chronicle my enormous love for american pitbull terriers. This newfound passion stems from the opportunity to raise a loveable, vain, most-of-the-time-immature, and playful pitbull. I’m mummy to Maxx, a 6-year old standard pit who’s turning seven on the 26th! 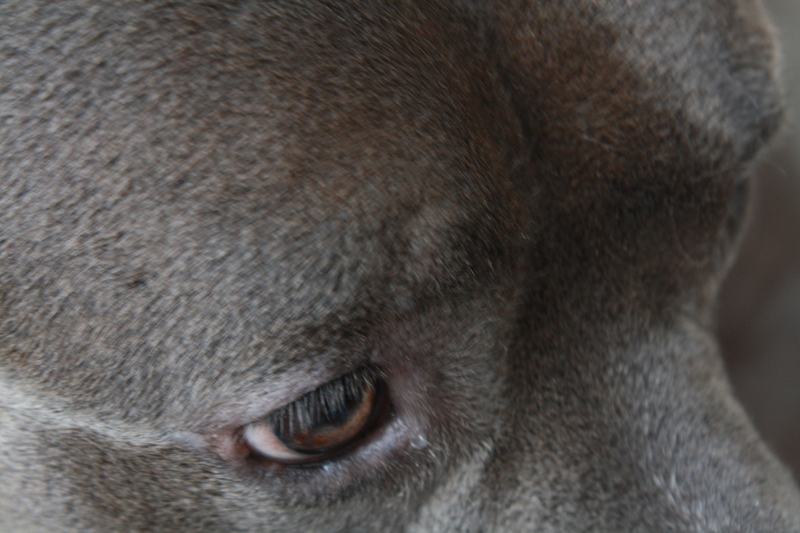 I am brutally against raising pits for dogfights and I strongly advocate adopting pitbulls. Welcome to Pitbullera! All things pitbull! I tackle the best and the worst news about the breed and will be throwing in stuff about the other pets I own and other great animal news and whatnot. I currently care for an adorable pittie named Maxx and would like y'all to know of his adventures (and lots of misadventures!). FYI, he's super friends with: Katinka (ball python), Nikko (red-tailed boa bci), and Greyhound (a cute, gray rat).